When we started opentaps nine years ago, our goal was to create great business software from open source. And have we ever! Most people wouldn’t have believed that enterprise-class open source ERP and CRM was possible, but we did it — thanks to Linux, Apache, MySQL, PostgreSQL, OFBiz, JasperReports, and many others open source projects. The world, meanwhile, has moved forward too. It’s no secret that the future of software is mobile, social, and big data, and open source software is moving in those directions as well. What does this mean for real businesses? Imagine being able to capture all your interactions with customers as they happen: by email, on twitter/Facebook/pinterest, via text messages, or by phone. Anywhere. Any time. Any how. Then imagine being able to use that information to make your customers happier — and sell more. That’s what we think a whole new generation of open source software could do for you. And we’ve started by creating a whole new opentaps to do it. Because it is built with a whole new different set of open source technologies and a different cloud-open source business model, we’ve created a new site at opentaps.com for this new product. 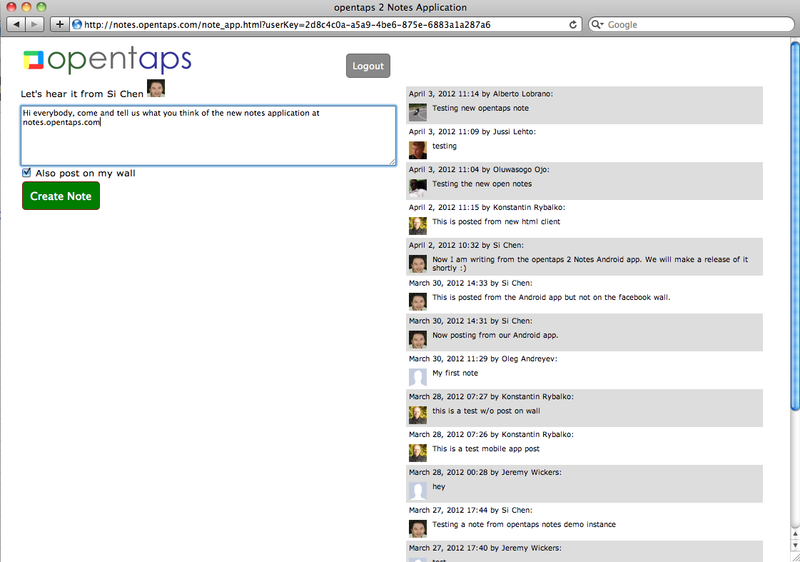 Meanwhile, the existing open source ERP and CRM lives on at opentaps.org and will continue to evolve. We hope you’ll join for the next phase of our journey — the best is yet to come. If you’ve ever thought, “There’s got to be a better way,” take a look at opentaps CRM2. The new opentaps CRM2 takes a completely different approach to opentaps 1.x or any other major CRM system out there. Instead of having all these screens and forms for you to come and enter data, we’re bringing opentaps CRM to you: We’re automatically capturing the discussions, emails, and tasks that are the back bone of your relationships with your customers, bringing them into the cloud, and helping you manage them there. Oh, also: We’re making it as easy as possible for you. There’s no big software package to download or install. No database to set up and maintain. No code base to merge and upgrade. You don’t even have to ask your users to stop using their favorite email program. You just sign up for an account, plug a few simple widgets into your existing opentaps instance, and synch up your users and emails. Sounds pretty cool, doesn’t it? Our beta users have thought so for about a year now. Why don’t you give it a try and let us know how it goes? Simple as it sounds, but unfortunately this is not how most business software is built: Most business software is very targeted to a small group of users, and their creators and consumers often focus more on features lists than actual usefulness. opentaps should be easy: easy to set up, easy to use, and easy to extend. It should be hosted so you don’t have to download and install anything. It should work where and how you want to work. Finally, if you know any programming, you should be able to extend it without learning a new framework or language. We’re not here just to build an ERP or a CRM. We want to help any group, no matter how big or small, work together more effectively. The first opentaps was good for big companies with teams of programmers or consultants. We want the new opentaps to work for everybody. Tell us how opentaps could make your organization work more effectively. We’re listening. Can NoSQL Databases Cure Us of Software Complexity? Q: What’s the difference between internal name and product name? A: If your company wants to maintain an internal name for products that’s different than the standard product name, then you can put it in internalName. Otherwise you should keep them the same. You can try the opentaps v2 Notes application at notes.opentaps.com or see a YouTube video for the new opentaps v2 user interface. For developer documentation, please see our wiki pages about opentaps 2. The new opentaps OFBiz FedEx integration module provides FedEx web services integration for both opentaps and ofbiz. Important: because the current Ship Manager Direct API will be discountinued by FedEx on May 31, 2012, you will need to get this module to continue shipping with FedEx. opentaps Endicia integration module now supports generating USPS shipping labels from opentaps or ofbiz. See shop.opentaps.org for this and other modules to improve the capabilities of your opentaps system. opentaps in the Cloud, our popular Amazon EC2 deployment option for opentaps, is now available on the Amazon m1.medium instance type. This new instance type was introduced recently by Amazon and offers the equivalent of 2 processor cores and 3.75 GB of available RAM and can be used to host opentaps for a small organization. To use this new instance type, subscribe to the opentaps Mini AMI and choose m1.medium on startup. European and Latin American companies looking for a fully-featured, low cost, and flexible business management system can now leverage the power of opentaps Open Source ERP + CRM, which now offers improved support for Value Added Taxes (VAT) and Spanish translations. These enhancements make it easier than ever before for companies in these regions to use opentaps as an alternative to expensive, inflexible, or outdated commercial ERP or CRM systems.